From time to time, I get to take a surreptitious glance at the Symphony/IRI tracking numbers for beer. Because Symphony tracks grocery store sales, it's a great way to see what's happening in national trends, especially among the bigger breweries. For decades now, a portion of big beer's income comes from a slice of marginal products aimed at non-beer drinkers. A few years past it was hard teas and lately shandies have been popular. They're all light and sweet--alcoholic sodas--and sold more on the basis of novelty and hype as flavor. In a few years, the novelty wears off, sales tank, and they look for the next big thing. Now it's cider's turn. AB InBev releases Johnny Appleseed next month. St. Louis-based A-B, the North American headquarters for A-B InBev, confirmed the beverage will launch next year, but more details about the packaging and marketing plans won't be released until early 2014, according to Paul Chibe, vice president of U.S. marketing. TV spots, which begin on March 31, feature a mutton-chopped character named Cornelius who witnesses male feats like boulder-splitting and blacksmithing, while describing Smith & Forge as "strong, sturdy, but not too sweet." At 6% alcohol-by-volume, Smith & Forge is slightly above the average cider alcohol content. Packaging for the cider, which comes in 16-ounce cans, highlights the alcohol content in orange and includes the tagline: "Made Strong." For what it's worth, these both seem like half-assed responses to a market they don't understand. Rather than attempting to help strengthen a product line and gain a foothold there--as Angry Orchard has done--these are nothing more than momentary lunges at a trend. The "brands" (such as they are--more like "the lame ideas we came up with over lunch") are transparently corporate and risible. Smith and Forge, promoted by a fake lumberjack, is simultaneously weird (lumberjack?) and skit-thin. A-B didn't even bother to come up with a terrible image. 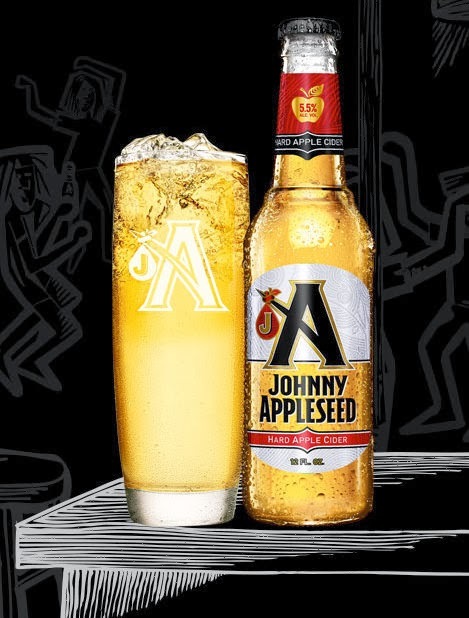 They just lamely offer this excuse for a product: "Inspired by a legendary adventurer and storyteller, Johnny Appleseed Hard Apple Cider was created for anyone with a story to tell." Yeesh. It probably won't be good for cider, but it probably won't be too bad, either. They seem destined for the same dustbin as Shock Top Lemon Shandy and Twisted Tea. I would like to respectfully comment. You wrote: "They're all light and sweet--alcoholic sodas", and then go on to say, "They're pitching it as a product to pour over ice. (You may now shudder.)" Well, if they are beers then OK shudder. However, if they are alcoholic sodas then I almost have an expectation that they would be poured over ice. Therefore, that doesn't seem odd to me. Not necessarily the beverage I would choose but alcohol-pops over ice is pretty accepted I would think. So are you shuddering because you don't like alcoholic sodas or are you shuddering because you do like alcoholic sodas but don't like them over ice or are you shuddering because a two word comment is the extent of your game?